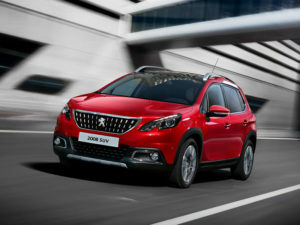 Peugeot extends 2008 offering with addition of new Allure Premium grade trim. The new trim grade is said to include more than £1,400 worth of additional equipment over the Allure trim at a price increase of £800. This includes a 7″ touchscreen with sat nav, voice control and TomTom live updates, as well as Peugeot’s Connect SOS & Assistance and a colour reversing camera all as standard. Additionally, a glass roof with electric blind adds ambient light to the interior’s Oxford Black trim. Externally, colour-coded mirrors and door handles, a rear sports spoiler and a variety of other subtle touches to the design offer a more sports stance. Both the three-cylinder 1.2 PureTech 82 petrol and 1.6 BlueHDI 100 diesel are available in Allure Premium, offering 57.6mpg and 76.3mpg respectively. CO2 emissions are also kept low, emitting 97g/km on the 1.6 BlueHDI. The Peugeot 2008 Allure Premium is available at dealerships and via Peugeot’s Order Online now.